With cake week under their belts, the 11 remaining bakers must now prove themselves with biscuits. The signature challenge is biscotti. Twice baked, these Italian specialities have to be crammed with flavour and have a crisp crunch. It's a delicate balance between underbaked and bendy, or overbaked and rock hard. Paul chooses the technical challenge, arlettes, a labour-intensive reverse puff pastry biscuit from south-west France. Wafer-thin, flaky and swirled with cinnamon, delicious to eat but devilishly difficult to make. And finally, the showstopper is to create and build an edible biscuit box filled with 36 biscuits of a different flavour. 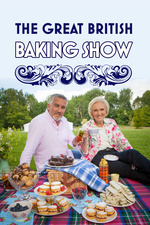 Judges Mary and Paul want to see the bakers exercise their creative muscles with clever construction and beautiful decoration, while not forgetting that flavour is king. There were some real calamities this week! Clearly the pressure is getting to them. I really expected Dorret to go, as she doesn't seem to be coping very well with the process. Spoiler alert (I guess spoilers are allowed in the thread?? ): What a surprise how quickly Marie fell from grace. I don't expect Dorret to last much longer. But my new co-favourite (alongside Nadiya) is Ugne. I loved how sympathetic she was towards Alvin when he couldn't put his box together. Come to think of it, I love Alvin too. So many great contestants this year to root for! I like the group this series. Getting rid of Stu in the first episode cleared out the one annoying person for me. So now, each person who's sent home is going to hurt. Is a stamped frog really any worse than just using a round cookie cutter? i admit i wished marie was given another chance and dorret was sent home this week. it is interesting to show the others that it doesn't matter how last week went for you - every week you have to compete. Just getting around to watching this here in the U.S. and I am very upset about Marie leaving. She, like Nancy in the previous season, had such a easygoing attitude and everything she made seemed to at least taste very good. It's really a testament to how great this show is that within TWO EPISODES I can be emotionally distraught about a judgement. If this were a show like Masterchef, we'd still only be getting pass the auditions and would barely know contestant names.